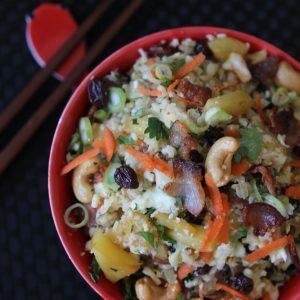 If you’ve been reading my blog for awhile, you know I’m a huge fan of cauliflower rice. As evidenced by the Pineapple Fried Cauli Rice HERE, the Cauli Rice Tabouleh I made HERE, and the Cauli Rice Paella I made HERE. See what I’m saying? Now it’s time to bring in the salmon. 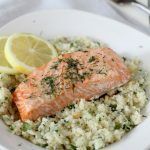 While I’ve always grated or processed my own cauli rice, I decided to give Whole Foods Market’s pre grated rice a shot this week and pair it up with some Coho Salmon I picked up for their One Day Sale. I can only speak for myself when I say I always make a mess processing it myself. I’m leaning towards the fact that’s because I’m a hot mess in the kitchen, but regardless it always gets everywhere. So it was refreshing to just be able to open the package and have fresh (not frozen) cauli rice ready for me. And yes, I still made a mess with it, but not nearly as big of one! And for all you Whole30 fanatics, I’m happy to say this thing is totally compliant for you! 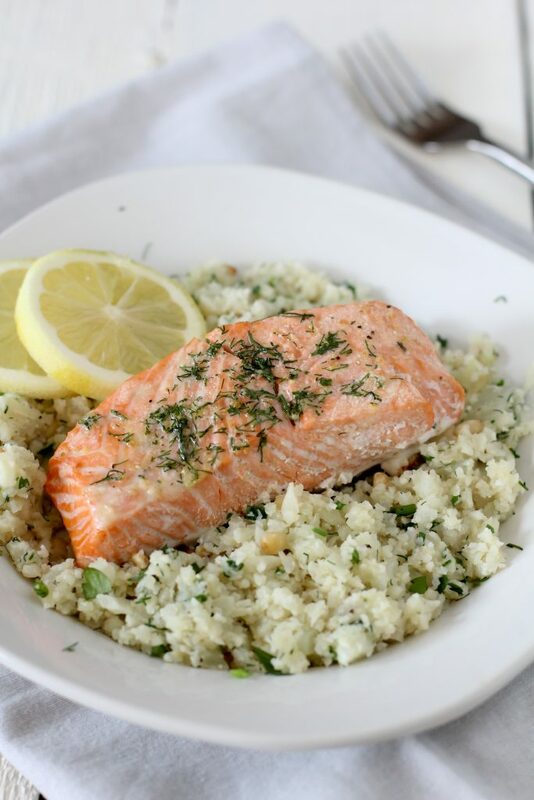 Roasted salmon served alongside fresh cauliflower rice. Loaded with herbs and lemon. 1 Tbsp. Chopped dill + 1 Tsp. 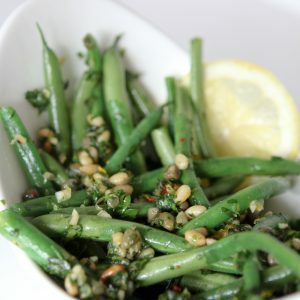 This recipe is DELICIOUS, even using dried herbs because I didn’t have fresh on hand. It seriously was one of the best salmon dishes I’ve ever made at home (and we have salmon often). I eyeballed quantities, and omitted the pine nuts (again, didn’t have any on hand and wanted to make sure this is a recipe I could do on a regular basis with stuff I usually have around). Absolutely great! We have recently been turned on to cauliflower rice and I look forward to trying some of your other recipes for it. Thanks for sharing. 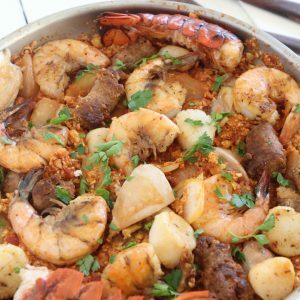 Pingback: Best Low Carb Rice Recipes - Making weightloss and getting fit effortless. Made this tonight and it was so yummy and very flavorful!!! Will definitely make again!